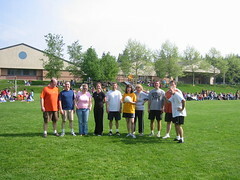 Southworth Sailor: Teachers win again! Every year the teachers of Sidney Glen play the sixth graders in soccer. CJ puts together three teams of sixth graders and they each get twenty minutes to tangle it up with the teachers. We actually have several good soccer players among the teachers, so it isn't really much of a competition, just a lot of fun. Esther spent much of the day with Camie, making the funeral arrangements and such. The service is scheduled for 6:00 pm, next Wednesday.